January | 2017 | The Glyn Watkins Show Page. Bring Back St. Blaise’s Festival Poster. The Bring Back St. Blaise’s Festival Diary. From 2nd to 5th Feb. Bring Back Great Knits Exhibition at Bradford Cathedral. Open 9.30 am – 5.30 pm, Bradford Cathedral, BD1 4EH. Friday 3rd. 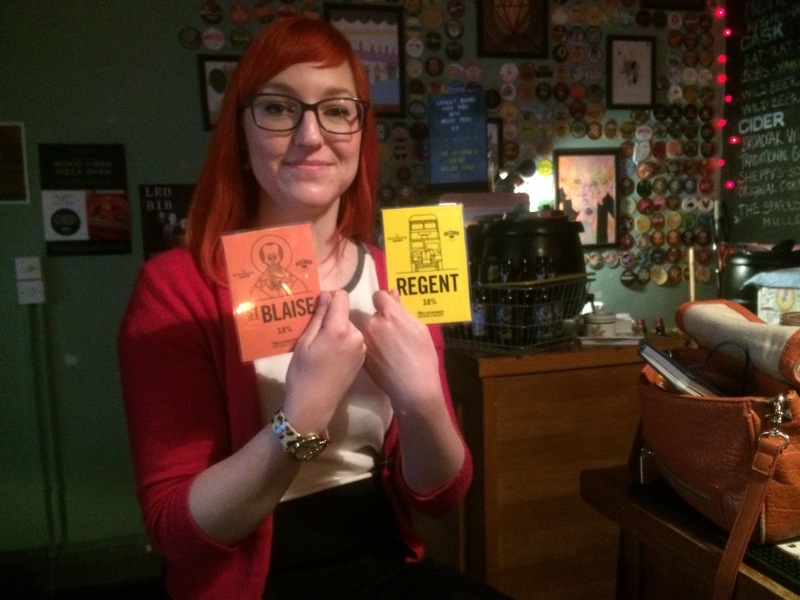 Bring Back St. Blaise Evening at Salamander Brewery, 22 Harry St, BD4 9PH. Saturday 4th. Bring Back St. Blaise Procession. Guided walk of about 7000 steps around Bradford. Meet 10.00. at the Record Cafe, North Parade. Set off 10.30. Cathedral; Paper Hall; Wool Exchange; City Hall; Jacobs Well; Priestley Statue; Bradford Beck; Lord Clyde; Kirkgate; finishing at the Sparrow by 13.30. Sunday 5th. 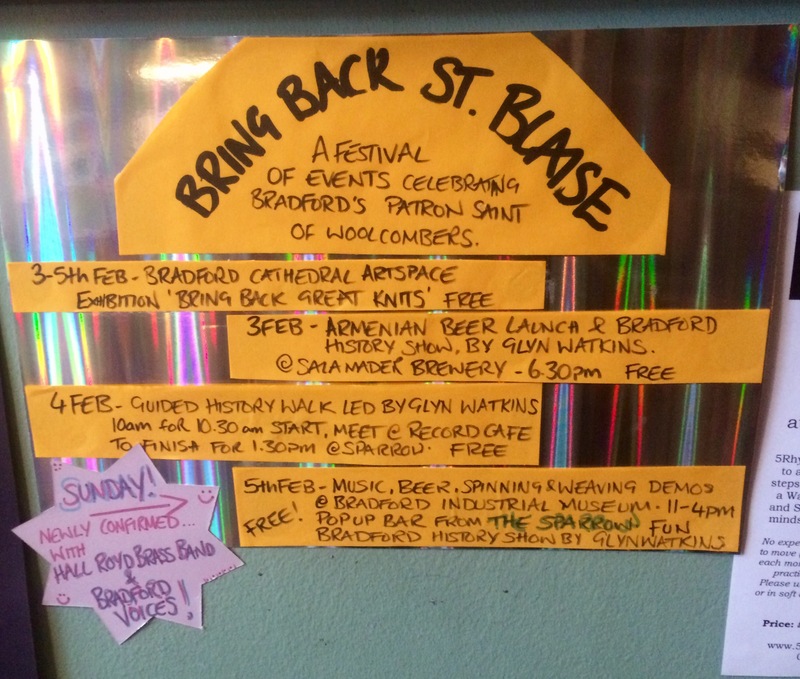 Bring Back St. Blaise Wool Day at the Bradford Industrial Museum. 11 am – 4.00 pm. Bradford Industrial Museum, Morrside Rd, BD2 3HP. Exhibition on Bradford and Bishop Blaise,; wool machinery will be working; Sparrow pop-up bar with Salamander beer (12.00 – 15.30); demonstrations by the Guild of Spinners and Weavers; and performances from Bradford Voices Community Choir, and the Hall Royds Band from 12.00. The biggest processions to ever take place in Bradford were to celebrate Saint Blaise. These recurred every seven years. Saint Blaise was an Armenia Martyr Bishop, famed for curing a child choking on a fish bone; and reputedly being tortured with woolcombs; becoming the Patron Saint of Woolcombers. All English wool towns used to celebrate his day, but Bradford’s were the biggest and best. Bradford developed with the wool trade, especially the trade in fine worsteds, made from long fibres (tops) that could only be got from combing; using heavy, heated combs. Worsteds made Bradford the largest wool town the world will ever know. Bradford’s woolcombers were a craft guild with a long apprenticeship. As Bradford grew, the Bishop Blaise procession grew. There may have been a thousand people in the 1825 procession, but unfortunately the woolcombers and handloom weavers went on strike soon after. After 23 weeks the strike was broken, and so were the woolcombers. Without the woolcomber’s organisation the Blaise celebration was almost forgotten. Mills replaced hand work, and almost every building standing in 1825 was knocked down before 1899. I have been trying to get people to celebrate Saint Blaise again for years: partly because of my love of history, but mostly because early February is a grim time of year and Blaise gives us a good reason to have a bit of fun remembering and rediscovering histories we all share. So why not join in? The Hall Royd Band and Bradford Voices Community Choir add threads to the Bring Back St. Blaise’s Festival.